“That looks… very shopped,” one Gizmodo writer said, when he saw the viral image of three chill dudes golfing as a mountain burned behind them. On the left side of the frame, there are two other people gazing at the blaze. The whole scene does indeed look very fake, another fine Photoshop forgery. But it’s not. 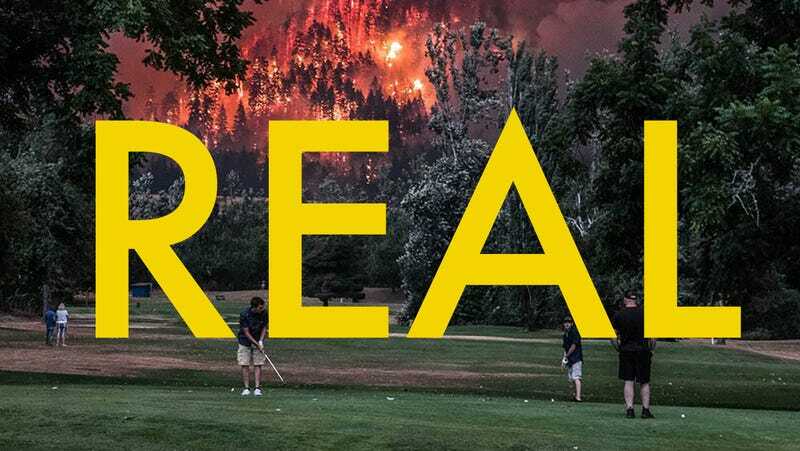 The owners of the Beacon Rock Golf Course in Washington state, which sits along the Columbia River Gorge where a massive fire has burned over 30,000 acres, confirmed to the local press that this photo taken at their course is very much real. One of the golfers pictured in the viral image backed up their claim, though he said the photo makes the situation look more dramatic than it actually was. Several other photos taken from alternate angles showing both the golf course and the nearby wildfires support these claims. Tamara Mayfield, who owns the Beacon Rock Golf Course with her husband, said that about 100 golfers were on the course Monday, when the photo was taken. Although the perspective of the viral photo makes it look like the fire is about to hit the golf course, Crawford, the golfer, said it was about a mile away and on the other side of a river. Still, despite such tremendous joke opportunities about golfing through the end of the world, the fires are serious. While there are countless photos of the Washington wildfires floating around the internet this week, we still don’t know who took the viral one. Kolsefor, the Redditor who uploaded it, explained in a comment that he had seen it on Facebook and uploaded it to Reddit, where it won over 50,000 upvotes. The Oregonian was also unable to identify the photographer. Kolsefor did post a few more images taken from similar perspectives, however, further verifying the viral image’s authenticity. Did you take the apocalyptic golf photo? Drop us a line. We’d love to hear more about what the end of the world feels like—as well as your camera rig!